I think $823 is a nice price for it! I'm a hacker who cracked your email and device a few months ago. You entered a password on one of the sites you visited, and I intercepted it. But it doesn't matter, my malware updated it every time. Do not try to contact me or find me, it is impossible, since I sent you an email from your account. Through your email, I uploaded malicious code to your Operation System. Also I installed a Trojan on your device and long tome spying for you. You are not my only victim, I usually lock computers and ask for a ransom. But I was struck by the sites of intimate content that you often visit. I am in shock of your fantasies! I've never seen anything like this! After that, I combined them to the content of the currently viewed site. There will be laughter when I send these photos to your contacts! BUT I'm sure you don't want it. Therefore, I expect payment from you for my silence. I think $840 is an acceptable price for it! If you do not know how to do this - enter into Google "how to transfer money to a bitcoin wallet". It is not difficult. After receiving the specified amount, all your data will be immediately destroyed automatically. My virus will also remove itself from your operating system. My Trojan have auto alert, after this email is read, I will be know it! I give you 2 days (48 hours) to make a payment. If this does not happen - all your contacts will get crazy shots from your dark secret life! p.s. I can give you advice for the future. Do not enter your passwords on unsafe sites. I hope for your prudence. 最近常收到, 剛收到一封, 內容供參考 Hello! I'm a hacker who cracked your email and device a few months ago. You entered a password on one of the sites you visited, and I intercepted it. Of course you can will change it, or already changed it. But it doesn't matter, my malware updated it every time. Do not try to contact me or find me, it is impossible, since I sent you an email from your account. Through your email, I uploaded malicious code to your Operation System. I saved all of your contacts with friends, colleagues, relatives and a complete history of visits to the Internet resources. Also I installed a Trojan on your device and long tome spying for you. You are not my only victim, I usually lock computers and ask for a ransom. But I was struck by the sites of intimate content that you often visit. I am in shock of your fantasies! I've never seen anything like this! So, when you had fun on piquant sites (you know what I mean!) I made screenshot with using my program from your camera of yours device. After that, I combined them to the content of the currently viewed site. There will be laughter when I send these photos to your contacts! BUT I'm sure you don't want it. Therefore, I expect payment from you for my silence. I think $840 is an acceptable price for it! Pay with Bitcoin. My BTC wallet: 1DVU5Q2HQ4srFNSSaWBrVNMtL4pvBkfP5w If you do not know how to do this - enter into Google "how to transfer money to a bitcoin wallet". It is not difficult. After receiving the specified amount, all your data will be immediately destroyed automatically. My virus will also remove itself from your operating system. My Trojan have auto alert, after this email is read, I will be know it! I give you 2 days (48 hours) to make a payment. If this does not happen - all your contacts will get crazy shots from your dark secret life! And so that you do not obstruct, your device will be blocked (also after 48 hours) Do not be silly! Police or friends won't help you for sure ... p.s. I can give you advice for the future. Do not enter your passwords on unsafe sites. I hope for your prudence. Farewell. 我們使用BOX Solutions, 這些信都會被攔截, 我是使用[隔離報告]的[內容流覽]查看, 從第一封到現在都已一個多月了, 每週也都會有相同的信件進來, 到目前並沒什麼事情發生, 假的!! 另外可以加強的是建立危險附件的稽核條件, 把附件是危險的(例如, SCR, js,docm,exe,iso 等)這些都是會讓使用者一按就中毒的, 壓縮檔的話你可以設定條件為等候你審核, 只要是繼壓縮檔(ZIP,ARJ等), 就先轉寄給你, 先看過沒問題在放行寄給收件者. 沒有SPAM來擋, 就要多設定稽核了. 記得方向為 收信, 因為你MAIL主機沒有檢查SPF反查功能. 建議還是在Mail Server前面加個SPAM主機來稽核這些郵件, 另外可以加強的是建立危險附件的稽核條件, 把附件是危險的(例如, SCR, js,docm,exe,iso 等)這些都是會讓使用者一按就中毒的, 壓縮檔的話你可以設定條件為等候你審核, 只要是繼壓縮檔(ZIP,ARJ等), 就先轉寄給你, 先看過沒問題在放行寄給收件者. 沒有SPAM來擋, 就要多設定稽核了. 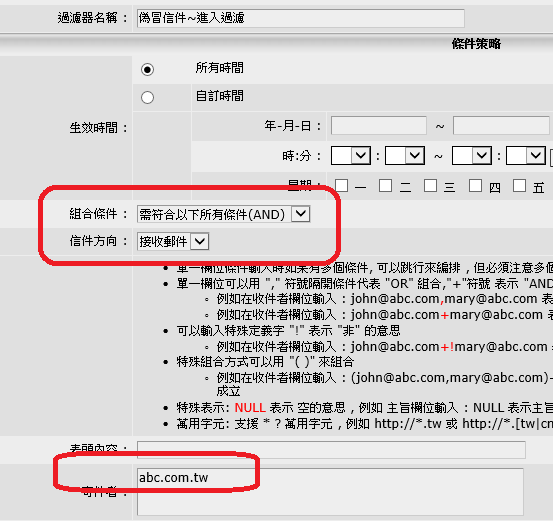 如何用 Windows Live Mail 收 Exchange Server的郵件 ?